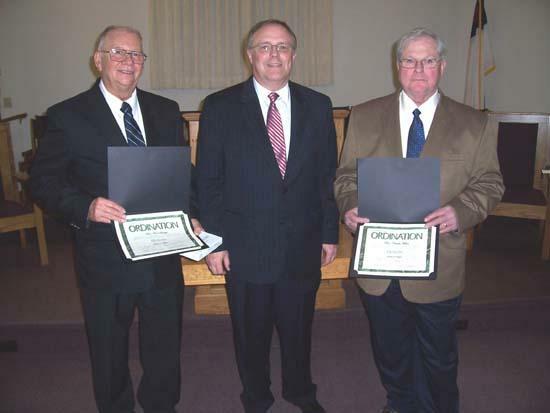 Shown during the ordination service at Lakewood Baptist Church are, from left, Ronald Savage, Bro. Wade Campbell, pastor, and Charles Fulton. Savage and Fulton are the first deacons to be ordained by the church. BEECH GROVE, Tenn. – At 3 p.m., on Sunday evening, January 24, 2010, Lakewood Baptist Church ordained two new deacons. Bros. Charles Fulton and Ronald Savage became the first deacons to be ordained for the church. The ordination message was given by Bro. Thomas Baines, associational missionary for Salem Baptist Association. Following the service, a reception was held in the church’s fellowship hall for the new deacons and their wives.